Above picture is of Snickers keeping a careful watch over her pups. 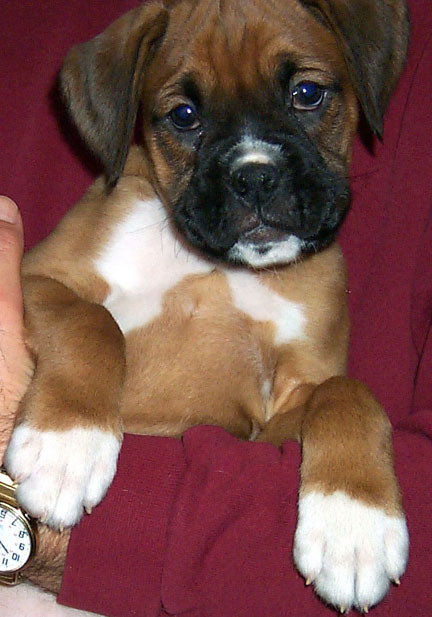 Shown below are the puppies on 3/20/02. 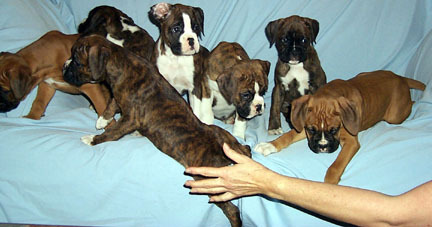 There are 3 females and 4 males. I took a series of group shots. They are always fun to look at. 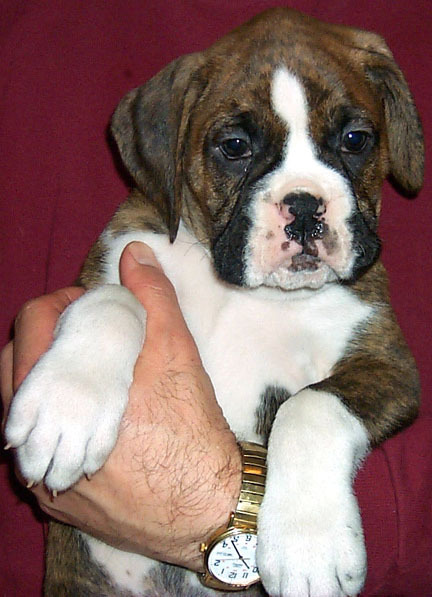 Male puppy shown above is Bavaria's Undaunted Blaze - Blaze. Owners are Ladd McClurg and Brade Oglivie. 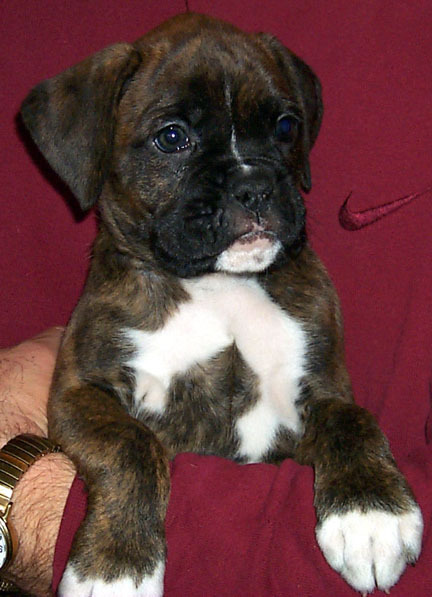 Female puppy shown above is Bailey. 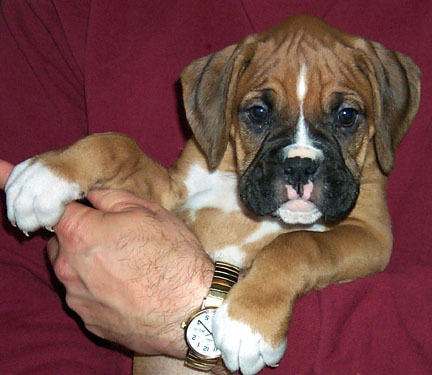 New owners are: Leo, Laura, Alexandra, Jacob, Leo III, and Olivia Worth. 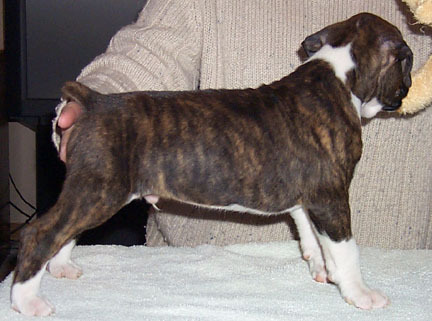 Female puppy shown above is Bavaria's B&B Best Spirit - Brea. New co-owners are: Betty Vos & Bob Coates. 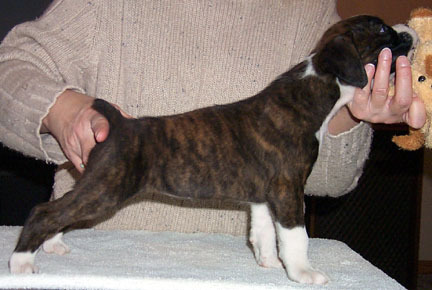 Female puppy shown above is Dancer. New Owners: Beth & Michele Carbone. 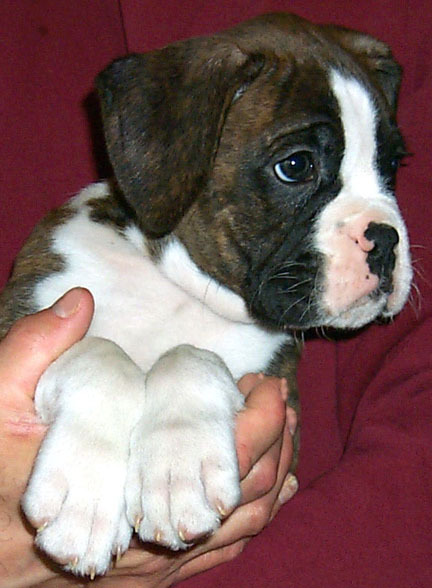 Male puppy shown above is Riley. New Owners are: Ann Kroger, Colin Cameron and Alexander. 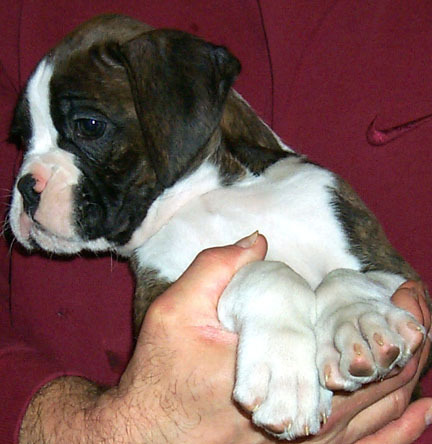 Male puppy shown above is Dempsey. New Owners are: James and Julie Cleary. 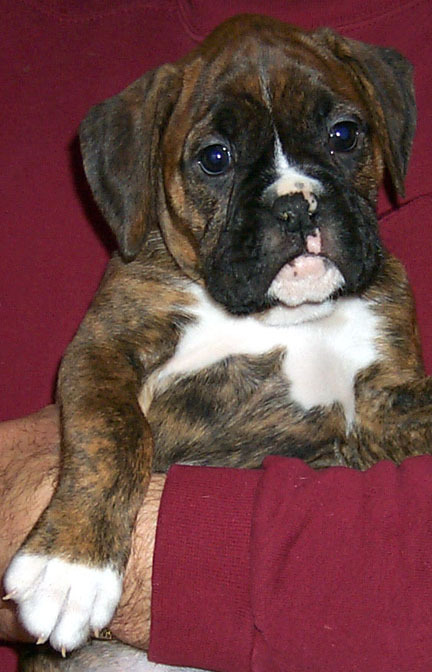 Male puppy shown above is Buster. New Owners are: Donna, Jeff, Jeff and Jaclyn Saurbaugh. Right now they look really good for their age, but they are way too little and young to tell for sure (D.O.B. 1-26-02). 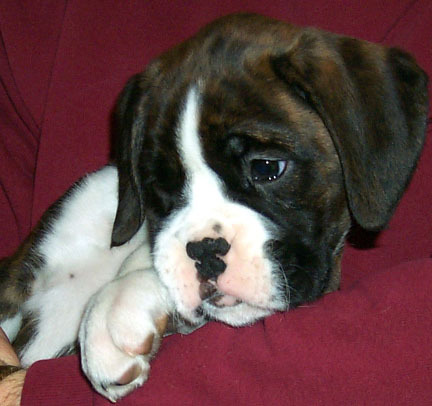 I watch them closely between now and 8 weeks of age. 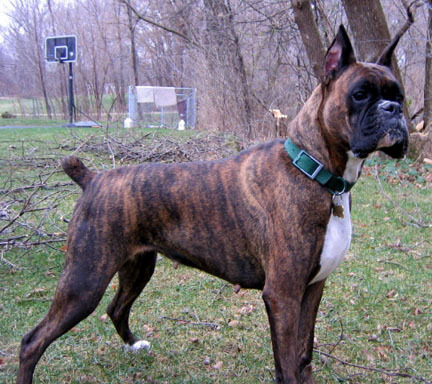 Any part of them may grow apart from what the breed standard calls for in the anatomically correct boxer. If that happens, they become a pet puppy. 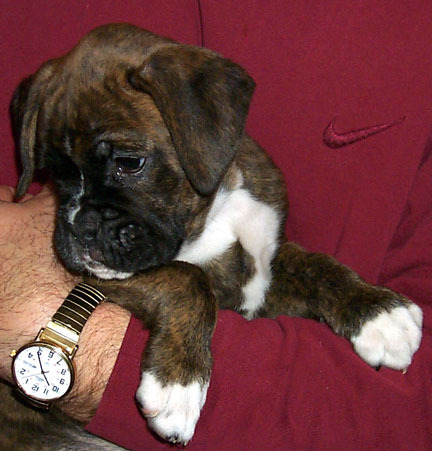 As it costs approximately $5-10,000 per year to show and campaign a show dog, I am extremely critical. 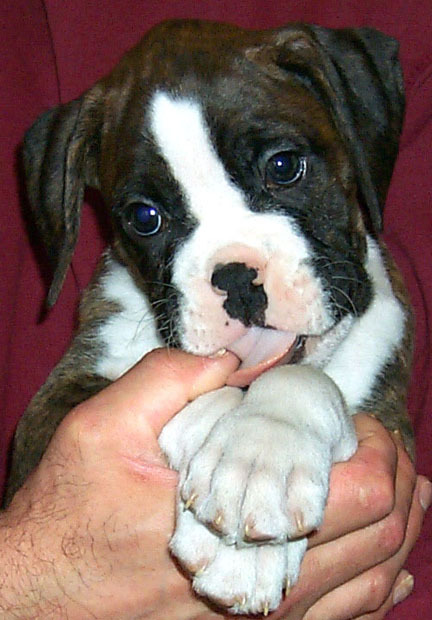 To keep costs down, I show my own dogs with no handling fees.